Tonmoy was living the life of a typical 6-year-old boy—climbing trees and running around. One day, while running through his house in Dhaka, Bangladesh, he accidentally bumped into the stove and knocked a pot of boiling water onto himself, severely burning his chest and arms. His family rushed him to their local hospital, and doctors there feared he would not survive. He did live through the ordeal and the painful treatment that followed, but because it wasn’t sufficient for the severity of his burn injuries, extensive scarring caused the skin on the wounded areas to contract and tighten. 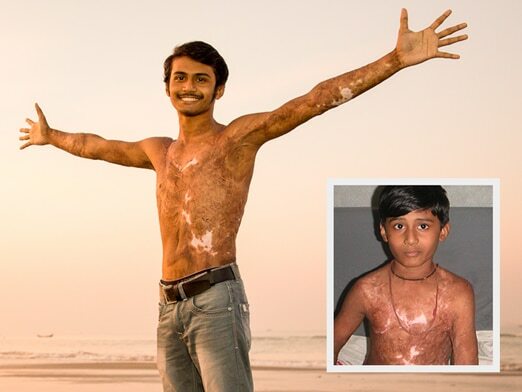 Burn scar contractures developed between his chest and arms, preventing him from being able to do his exercises at school or climb trees like he used to. As a result, he became ostracized from his friends and schoolmates, picking up art as a way to alleviate his boredom. Luckily, a few years later Tonmoy and his family learned about ReSurge and the surgical care we could provide to correct the disability he had developed as a result of his burns. In 2007, we provided his first surgery and have continued to follow up with him and provide treatment as he has grown into a young man. Tonmoy came to know our surgical providers and staff so well, he came to consider them family. “They are like my parents, who love me,” Tonmoy said. Today, Tonmoy has completely recovered and has full mobility in his arms. He is in college and has a remarkable outlook on his life and the experience of going through such a difficult injury. It doesn’t bother him that he doesn’t look exactly like everyone else. He doesn’t care about that. Tonmoy recently joined one of our surgical teams in Bangladesh as a volunteer, translating and helping to comfort other young burn victims as they faced surgery. He has dreams of becoming a doctor and working with ReSurge because of his experience being burned and later receiving such quality treatment. It has been such a pleasure watching Tonmoy’s transformation over the years as he has grown into an inspiring young man with incredible dreams and courage. We look forward to continuing with him on his journey and hope you will join us.